Scorer: Hemsworth MW's Sidney Santos (left). Hemsworth MW stayed on top of the Toolstation NCE League when they produced a stirring second half fight back to earn a draw at home to Bottesford Town on Tuesday night. After beating Thackley 4-2 on Saturday Wells led the table by one point going into the match and stretched the advantage by one despite finding themselves in serious danger of defeat when 3-0 down at the break. A poor start saw Wayne Benn’s men concede in just the second minute with Henry Cook netting. With Jack McMenemy and Wayne Graves adding further goals following defensive mistakes it was 3-0 at half-time. But Sidney Santos gave Wells a lifeline with a goal in the opening minute of the second half and belief came into the home side’s play as they forced an own goal then incredibly made it 3-3 through Nash Connolly. A winner could not be found, but Hemsworth could be pleased with the spirit they showed in their comeback. Hemsworth’s attack was in good form in last Saturday’s win over Thackley after temporarily dropping off the top of the table. They were given an early shock with Thackley taking a fifth minute lead when Luke Robinson’s shot could only be parried by keeper Danny Rusling and James Rothel put the rebound away. The visitors could have been two up soon after as Matt Broadley fired over following a dangerous run by James Ngoe. But Hemsworth settled to play their game and were unlucky not to level as Richard Collier fired over then saw his effort well saved by Luke Wilson. Brad Dockerty came even closer as he hit the post. Rothel and Broadley went close for Thackley before Hemsworth deservedly equalised through Nash Connolly after he raced clear right at the end of the opening half. 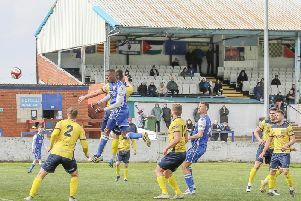 The good work continued into the second half as within three minutes Wells went ahead with Kris Hargreaves aiming to cut out a dangerous cross only to send the ball into his own net. Thackley quickly replied to make it 2-2 three minutes later, Kieran Thompson lifting the ball over the wall and into the top corner from a free-kick just outside the box. The action continued to be frantic and only a good save by Wilson kept the score level before Hemsworth went back ahead through Richard Collier’s well taken effort. Just after the hour mark Hemsworth scored a controversial fourth goal. Dockerty’s shot was cleared, but the assistant referee signalled that the ball had crossed the line. Thackley pushed men forward in a bid to hit back, but were caught on the break and could have conceded more. At the other end, Rusling saved from Robinson before the final whistle brought an end to an entertaining game. Saturday’s game saw the return of two former Hemsworth players after they re-signed midfielder Jason Yates and forward Sam Jones. Pleased to welcome both back, Benn added: “Both were very popular players in their previous spell for us and the quality they bring definitely makes the squad stronger. “Jason is returning after a couple of seasons away playing Evo-stik football and his decision to drop down a division and the sacrifice he has made financially to do so speaks volumes for the lad. “Sam Jones returns after a few months away and him leaving was more to do with work commitments and setting up a new business than anything else. He has been missing football and when he rung to ask if he could come back it was a bit of a no brainer for us. Hemsworth turn their attention to the FA Vase this Saturday with a first round tie away to famous north east club Bishop Auckland (3pm).